This magnificent phoenix has matured to it's adult form. Its radiant wings and majestic flight are most impressive. A sharp beak is a powerful tool in battle, yet is typically only used for feeding. Mostly living in extremely cold lands, phoenixes are encountered in the Arkene and around frigid tundra in the far north. 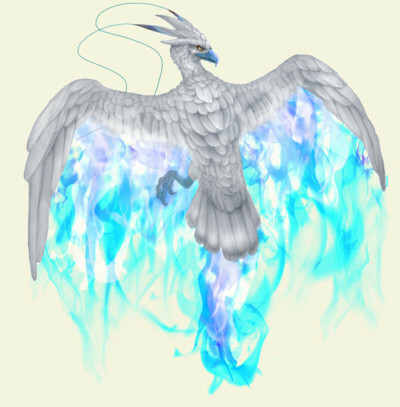 Cool blue and icy white are signs to other creatures of a phoenix's presence, and in due respect, most animals do not approach. An adult phoenix is a powerful ally, with great power over excruciatingly cold flame, and a creature you would not wish to face in the wild. Phoenixes are incredibly cold and icy in color. When a Phoenix dies it is consumed in freezing flames, and a new phoenix egg is left in the ashes. Because of their unique pattern of rebirth, phoenixes live for many centuries, and become extremely wise and ancient. As adults, they are beautiful birds with feathers resembling cold flames, and are extremely happy to travel to any cold climates. They have incredible mastery over frigid fire, and on a cold winter night will sleep outside, often burrowing into a snow bank or finding a sheet of ice to slumber upon.